Is your boardroom in need of a full scale makeover? We've got you covered. Today on the OFD blog we'll be highlighting the tips, tricks, and product suggestions needed to help you maximize corporate appeal and productivity. From effective planning to accenting your space, we'll tach you how to create a boardroom that's up to date with the latest trends without remodeling remorse. All professional remodeling projects start with effective space planning. If you don't take the time to properly plan and budget, you'll be setting yourself up for makeover mishaps that do little more than slow down your project momentum. The table serves as the focal point of the boardroom. To create a great space you'll need a table that's up to date with the latest trends. This year, modern conference tables with USB inputs are the latest craze. We recommend a Zira table from Global, but other options are available from brands like Mayline and HON. Once you've settled on a table, ensure that it's going to fit and leave an adequate walkway for guests to travel through when visiting. Rest assured, nothing is worse than an overly cramped boardroom. It will create frustration and make your guests feel overwhelmed. Cool chairs are important, but comfort reigns supreme. Don't be overly focused on selecting modern chairs. It's far more essential to choose chairs with good padding to help visitors make it through extended group strategizing session. 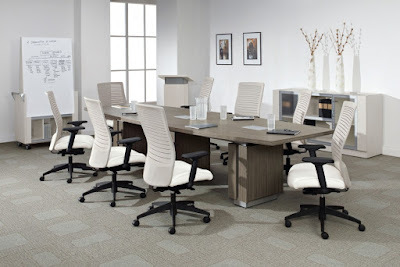 This year, European style boardroom chairs are going to be extremely popular yet again. The popularity of this trend has caused an influx of cheap knock offs and imitations that you should look to avoid. Sleek Euro style chairs are great, but only if they have reliable ergonomic features. It's very difficult to paint your boardroom after furniture and seating has been installed. Once you know when your furniture is going to arrive, pick a day to paint. Gray, light blue, and green tones will all be popular in 2018. They're also easy to blend with just about any furniture finish you chose. Last but not least you need to accent your space to make it pop. Once your boardroom table and chairs have been installed, you can assess your interior. Start by choosing accents that will actually help improve productivity levels. Marker boards, flat screen TV's, and wall cabinets are all great ideas. Once you've selected productivity minded accents, you can move on to more aesthetic components. Lighting fixtures, industrial wall art, and area rugs can all be integrated to pull your overall vibe together.